Home > Miscellaneous > Samadhi Caves: A place protected by giant spirits, where monks never die! Samadhi Caves: A place protected by giant spirits, where monks never die! Samadhi caves in Tibet are recognized because they are inhabited by Tibetan monks who have conquered death through a special meditation practice. Monks enter a state of hibernation, limit their body functions to the maximum, and all the while, the spirit watches over the things that happen in the body. However, physical and chemical laws are removed to prevent physical damage. Samadhi caves are considered to be pure places where only elected people can enter. They are recognized as sheltering the illuminated monks, who have simply discovered a way to trick death into their own. When they feel that death is approaching, they take a special position and begin the process of hibernation. One of them is Lama Daschi-Dorsho, who is said to be 162 years old and was the Buddhist leader of Russia. The medical examinations of his body have demonstrated a minimal function of the body, which is why he is believed to be still alive. However, he has been in the state of deep meditation for many years. Besides this spiritual leader, there are many others who are in the same state of meditation. Some have been there for over 50 years. His state of affairs is one between life and death, and their souls seem to be still watching the bodies, which have not degraded at all, in the passing of the years. Ernst Rifgatowitsch Muldaschew is one of the few lucky ones who managed to penetrate into one of the Samadhi caves. Muldaschew is an ophthalmologist and he has earnestly wanted to investigate what is happening with the bodies of the monks in the state of permanent meditation. Before entering the cave, a spiritual guide told him that the place is protected by a field of extremely strong consciousness that is capable of scanning every man's thoughts. If a person has no positive thoughts, then it is impossible for him to resist for long in the cave. This was the case with a number of Chinese soldiers who had the mission to discover and extract the secrets of a longer life, who suffered various injuries when they stepped into one of the caves. The researcher managed to enter the cave, but up to a point because he started to feel discomfort. During the time he visited the cave, he saw many incredible things that seemed to come out of the context of our world. The cave is said to be inhabited by undefined giants that protect the monks in meditation. These giants are not humans or beings of flesh and bones, but rather tall spirits, reflecting a white light. The monks are in an immortal state through samadhi meditation and despite their minimal functions, they no longer live. 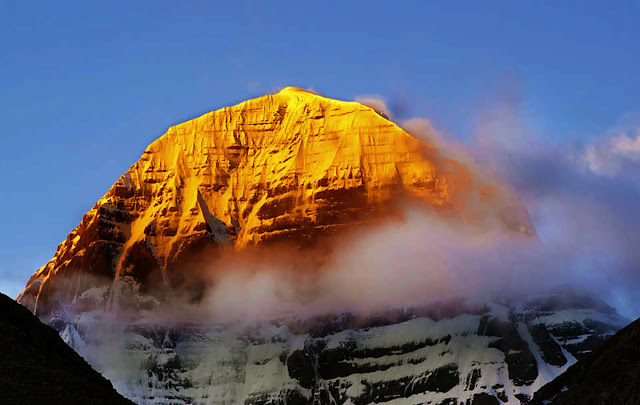 Tibet looks at the Samadhi Caves as a sanctuary, and Mount Kailash is the center of the Universe. The mystery of the Samadhi monks could not be solved until today, and further research is not possible because of the shield. The souls of the monks are out of the body, but they seem to be still linked to their body through a thin "spiritual tie". The medical evidence of the body's minimal functions indicates a sort of monk's life. They seem to be on the threshold of life and death, which allows them to resist hundreds or even thousands of years. We will never know why monks in the Samadhi caves have become immortal through meditation and if caves are actually inhabited by huge beings. Samadhi Caves are largely unknown to the general public, but they are still a point of interest for esoteric circles. The only problem is that to make research in these caves requires a man with pure soul and pure mind.